Blog posts in a WordPress site are listed in chronological order on the posts page, with the most recent at the top. Sometimes you may want a post to remain at the top of the list – to do so, you designate that post as a Sticky. For instance, if you have a news item that you want to remain at the top so that it catches readers’ attention for a while, just make it stick! 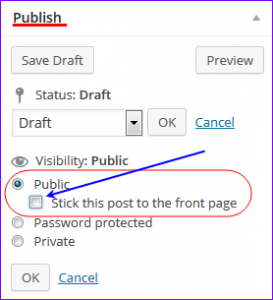 To make a Sticky Post, all you need to do is check the box in the WordPress post’s edit screen, and it will stick the post to the blog page, keeping it there even after newer posts are published. If at some time you no longer want that post to remain at the top, you can uncheck the Sticky box, and the post will go back to being listed in the usual reverse chronological order of blog posts. This feature is only available for the built-in post type post and not for custom post types.